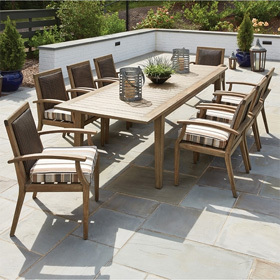 Designed to offer superior outdoor performance, this bistro table was constructed from weather-resistant, rust-proof wrought iron. With its smooth, solid top and elegant base, the table provides a sophisticated appearance that's easy to coordinate with both contemporary and traditional outdoor spaces. 24"L x 24"W x 27.75"H 40 lbs.